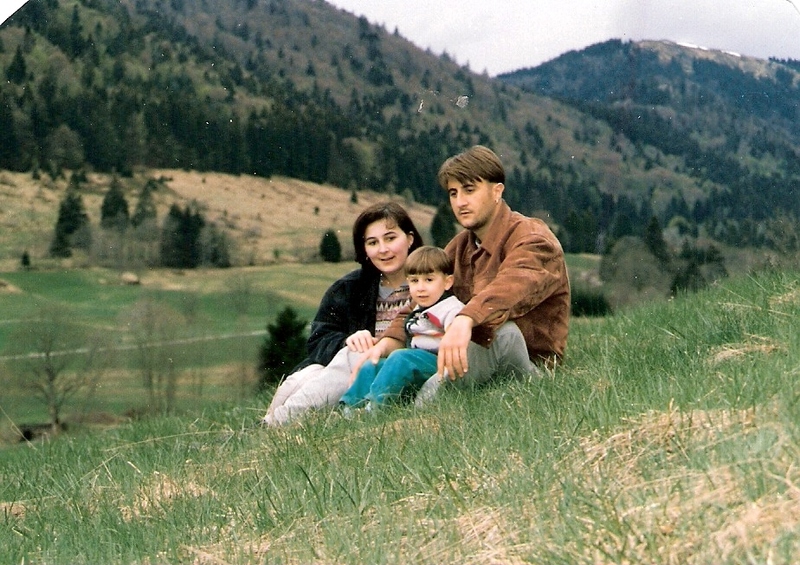 At the beginning of the 90’s when there was a war going on in Bosnia, we spent about six years in south-western Germany. That time was kind of a bitter-sweet time for us. Bitter, as we were adjusting to the completely new life, new language, new country, new people, and we worried about the loved ones that were still in Bosnia. Sweet, because we got married and had our babies, and we have learned a lot about life and to always look forward no matter what the circumstances are. Well, how do the pretzels tie into this whole story? Simply, every time I see them, a wave of memories splashes over me and brings back the pictures of the beautiful German towns, walks and bike rides along the Rhein river and Fairytale-like Black Forest villages and small bakeries filled with the best bread and pretzels in the World. The preztels have somewhat crispy crust and are soft inside. 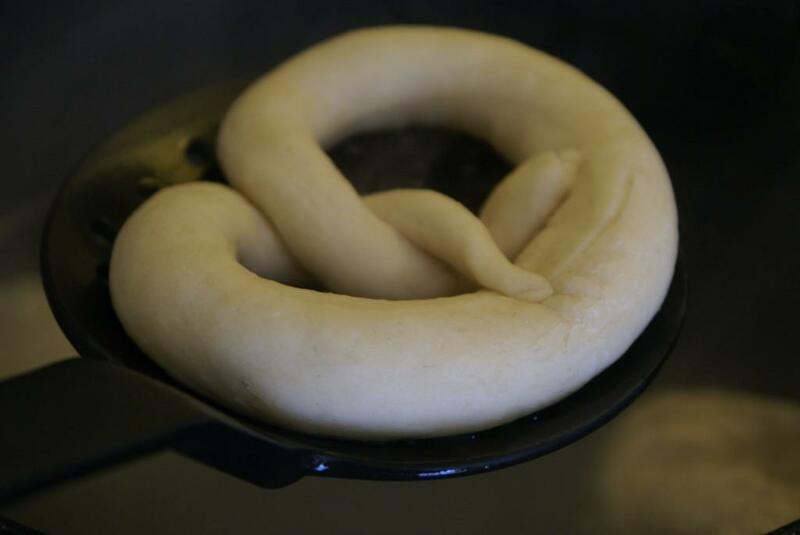 In southern Germany, they are called Laugenbrezeln because of the specific way they are made. Before baking they are dipped in a NaOH solution, which is neutralized during baking and gives the pretzels their distinctive taste. When made at home they are dipped in solution of baking soda and they taste fantastic (maybe not 100% as the German original, but 90% for sure). Sift the flour mixed with salt into a bowl and make a small hole in the middle. Thinly slice butter and place around the hole. Dissolve the fresh yeast in the warm milk and start pouring into the flour, mixing at the same time. Knead the dough by hand for at least 5 minutes. Dough will be quite firm and smooth and not sticky at all. Form a dough ball and let it rest covered for about 30 minutes. Place the dough on a work surface and cut into 10 equal pieces. 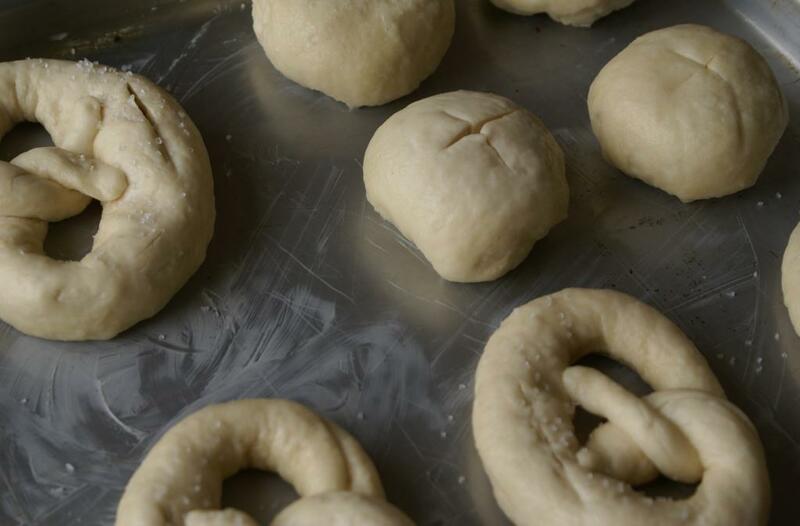 Form the pretzels or rolls. Boil the water and add the baking soda. Adding soda to the boiling water will make quite a reaction, so be careful!!! 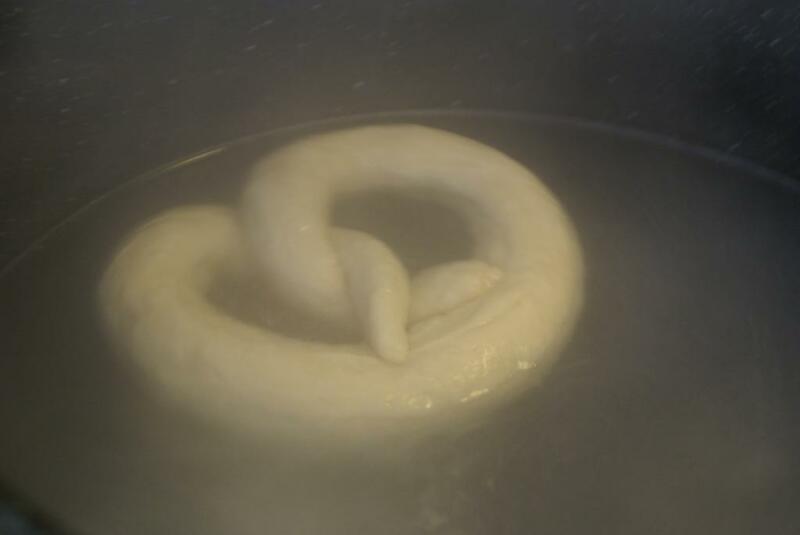 Let the water simmer and place each pretzel in the solution for about 30 seconds. 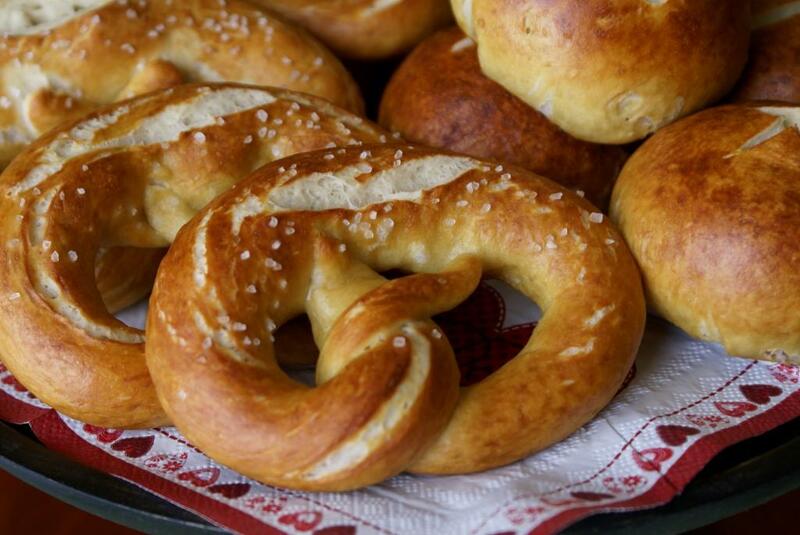 Take out pretzels with a skimmer spoon and place them onto a well buttered baking pan. 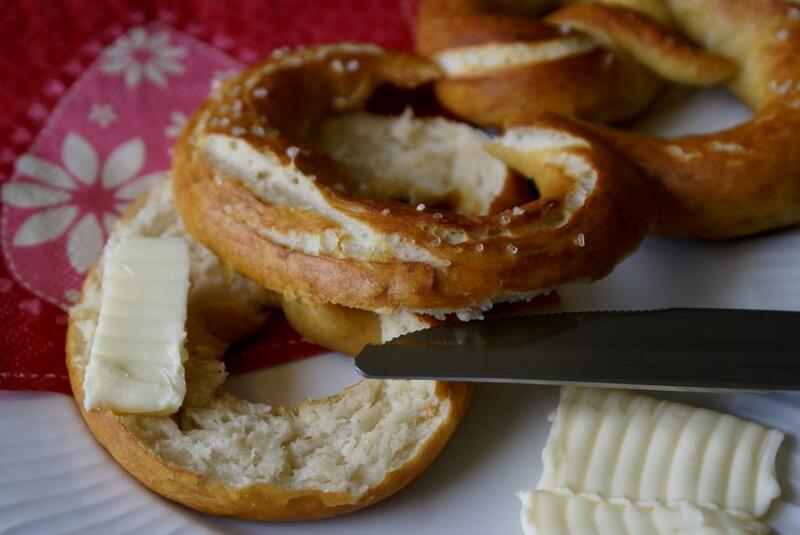 With a sharp knife or a razor cut the small slit on a top of each pretzel or a small cross on each roll. Sprinkle with coarse salt. Bake at 395 F (200 C) until golden brown. 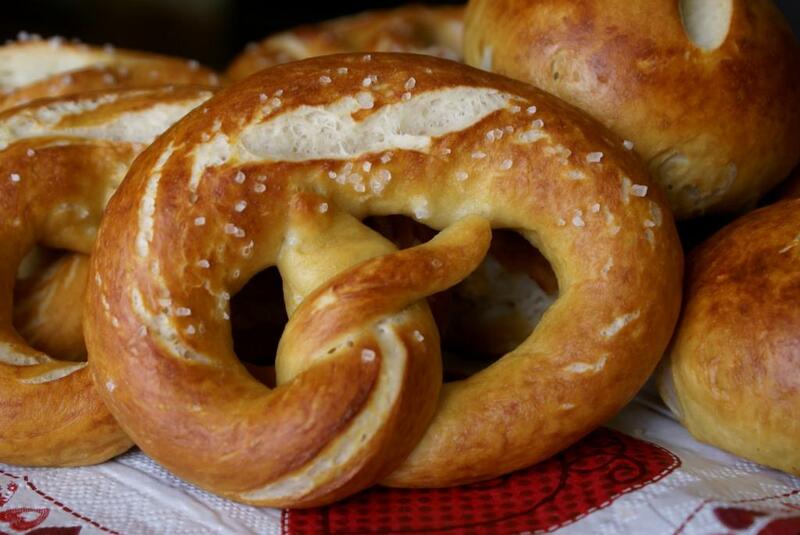 Bavarian pretzels are usually served sliced horizontally and spread with butter. *** Fresh yeast can be substituted with the dry yeast (use 1 and ¾ TSP). Mix the yeast with flour and salt, then add butter and warm milk and make the dough. 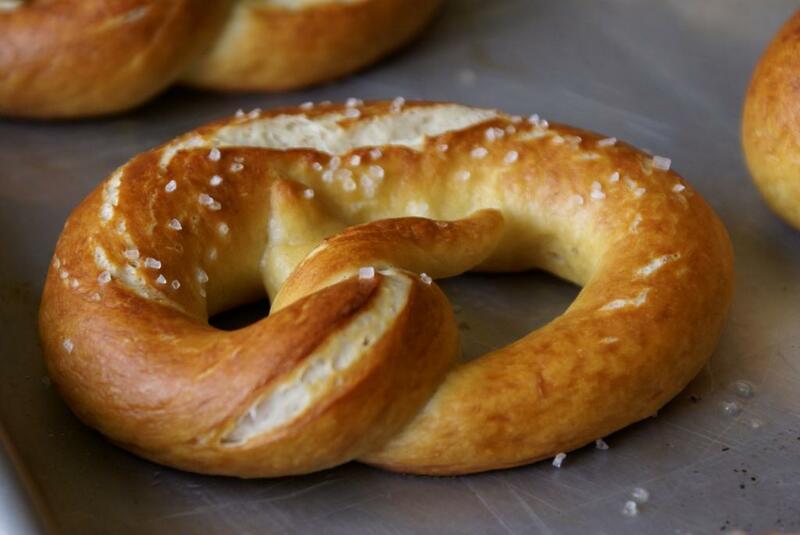 There is nothing like a freshly baked pretzel. Thanks for the recipe! Thank you! Yes, it felt very safe, but it was a difficult and sudden change, something that we didn’t plan… Anyway, we made it and the second time coming to the US! 🙂 Having these pretzels on our table this morning made our breakfast very special! The pretzels are maybe relective of how you felt during this transitional time. All knotted up. Every experience in our lives makes us stronger and brighter. Obviously something good must have rubbed off on you as these pretzels look wonderful. I can picture them chewy and soft but hearty. Yum. Yes, it was a life changing experience and I have learned a lot from it! Bavarian/German pretzels taste wonderful! The special way they are made gives them a very specific taste! Yum! Thanks for the recipe. I just made these and they’re amazing! Thanks for stopping by and for using my recipe! 🙂 I am glad you liked them! I try to make them at least once in a month or two for our family Sunday’s brunch. We love them! My husband was just mentioning he would love it if we could make some home made pretzels! Now you guys have an authentic recipe to use! 🙂 I think this is by far the best pretzel recipe that I’ve ever tried! Thanks for visiting!!!! I am so happy to hear that! 😀 Love to you all! Enjoy your weekend! I recently went gluten free and one thing I really miss is big soft pretzels like these. I think I will try it with gluten free flour and see if I can get it to work.